Currently the Architecture Forum within The Open Group, responsible for TOGAF® is working on a formal response related to the definition of EA. 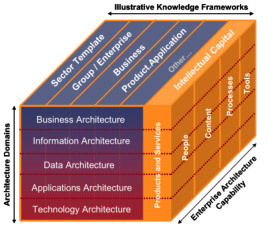 Enterprise Architecture is the cornerstone of Real IRM’s market focus. EA is the vehicle we use for integrating the resources necessary to create a complete view of the organisation, as well as to provide products and services to facilitate the organisation’s transition to an integrated environment with optimised processes that are responsive to change and to the delivery of the business strategy. An enterprise architecture role within an organisation is cross-disciplinary, requiring integration of diverse skills, methods and tools, within and beyond the technology community. Holistic EA is pragmatically developed through the ongoing collaboration between business role players, the IT executive team, and the EA team. In order to understand EA and our solution offering, it is important to comprehend how the knowledge frameworks, the EA Capability, and the Business, Information, Data, Application and Technology (BIDAT) architectures are systemically inter-related. We advise the reader to refer to the diagram while reading the following subsections.